The Kansas Adjutant General's Report, 1861-1865, lists the names of troops who served in the Kansas volunteer regiments during the Civil War. This index includes the name, regiment and company, and place of residence for each soldier. 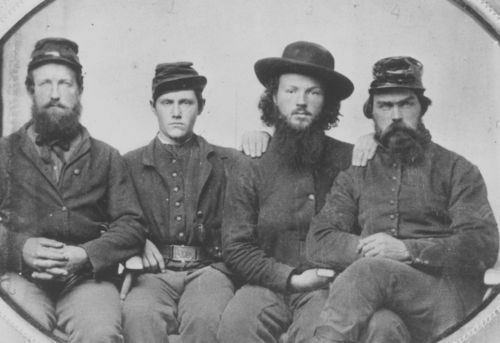 See Kansas Memory for the muster rolls of Kansas Civil War Regiments online. The far right column in this index indicates whether the soldier's enlistment papers are also available at the Archives. These enlistments are available online from Ancestry. This index, prepared by volunteer Fred Delap, includes the name, regiment and company, and place of residence for each soldier. A few Kansans who served in non-Kansas regiments are included. It does NOT include all Kansans who served in the Civil War. In particular, it does not include the Kansas Civil War Militia. The original report also includes each soldier's rank, the place and date of enlistment, his discharge date, and notes about promotions, prisoner of war status, and other events. If a soldier died on active duty, the place, date, and cause of death are listed. The regimental histories are on the Kansas National Guard website.